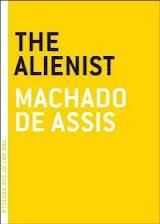 For a Brazilian writer of the 1800s, it is perhaps remarkable how much of Machado de Assis’ work has stayed in print in English. His masterpiece, Epitaph of a Small Winner, appeared in a new edition only a few years ago, and, more recently, a number of his short stories have been made available to download. Of the translations which have fallen out of print, the most difficult to source for a number of years has been The Alienist which originally appeared in 1963 (in the same translation by W. L. Grossman) in The Psychiatrist and Other Stories. Luckily Melville House have re-issued it as part of their ‘Art of the Novella’ series which has so far provided an interesting mix of the renowned and the less well known. Anyone, he feels, who lacks “equilibrium of the mental faculties” must be insane. As equilibrium is hard to find, the asylum quickly fills up until the townspeople rebel. Bacamarte attempts reversing his definition of madness and imprisoning those who show too much equilibrium, but again he is not satisfied. By this point, you can probably guess where the story is heading. Despite its age (psychiatry was clearly in its infancy when it was written) de Assis provides an amusing satire on the difficulties in deciding who is sane and who isn’t (and how this power can be abused). He also combines this with a dig at local politics with various groups coalescing for and against the asylum. A blind respect for science (or perhaps simply fame) seems to be another target as Bacamarte is allowed to do much as he pleases simply because he is held in such esteem. Even when he is eventually challenged (by an angry mob – and it doesn’t get much more challenging than that!) he is able to skilfully deflect the blame and carry on as he wishes. De Assis may deliver the tale in a deceptively light tone but this does not prevent it from being both thought-provoking and relevant. You are currently browsing the archives for the Machado de Assis category.